The first time that you open Windows Media Center, you will find a wide variety of menu options that are likely to far exceed what you will ever want to use. Customizing the menus to suit your personal or family needs is an essential part of the configuration process if you don’t want to get lost in the menu options. The only problem is that Windows Media Center has no built in tools to do this. That is where Media Center Studio comes in. 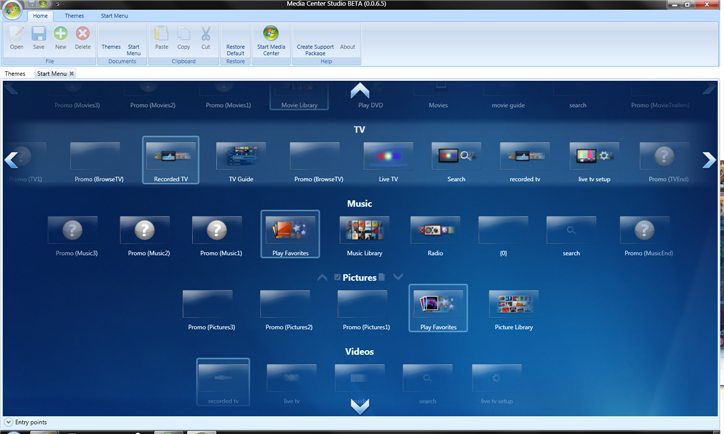 Media Center Studio is a stand alone program that lets you customise your Windows Media Center menu to exactly the way you want it. It allows removal of unused icons and the freedom to move around icons in a way that is more suited to the way you use Windows Media Center i.e. If you watch mostly recorded TV, recorded TV can be highlighted when Windows Media Center starts. Media Center Studio also offers theme support which will be a very nice feature as more themes are created. It also allows you to make your own menu strips so you could add a strip for games, another for programs, and anything else you could possibly want. I have mostly used it to compact the features I use into a more logical arrangement. Media Center Studio displays your current default menus. The title of each menu strip can be changed, and the contents of each menu strip can be moved around with its easy to use drag and drop interface. If you want to remove a menu strip or menu item, simply untick it. Windows Media Center has a bunch of hidden promo boxes that can be removed. If you want to add your own programs, there are extensive facilities to do that. You can even give the program or game your own logo making the media centre truly yours. If you make a mistake, there is a button to restore everything back to default, so there is no risk in trying different configurations of the menu strips. Once you become familiar with this software, any changes are incredibly quick and simple. Grab your copy of Media Center Studio for free from Advent Media Center.